Over the coming weeks, we are expecting to see a significant increase in media coverage of planning issues, including Marlet’s Judicial Review proceedings in the High Court. Bear in mind that much of what will be presented in the media will be carefully crafted PR speak. 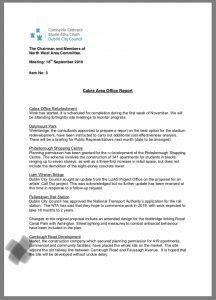 Also bear in mind that this case is the first challenge to Minister Eoghan Murphy’s fast track planning system. Lastly, don’t forget that you have a constitutional right to be involved in the planning process. Under new fast track legislation which excludes the public’s right to an appeal, An Bord Pleanala grants permission to Marlet to build at St Paul’s. Three separate parties apply for and are granted leave to seek a judicial review of the Board’s decision. There is no automatic right to a Judicial Review, you must produce ‘grounds’ and a Judge must be satisfied that there is a case to be made. A High Court judge ruled that there were in fact substantial grounds for a judicial review in this case. Before legal argument is heard in court, Counsel for An Bord Pleanala inform the court that there is an ‘error on the face of the record’ in terms of the recording of their formal decision granting permission. They request that their decision be quashed. An Bord Pleanala issue a new decision, overturning their original decision and refusing permission at St. Paul’s. This happens without any opportunity to present arguments in court. Marlet seek a Judicial Review of that decision. This is their legal right, in the same way that the public had a legal right to seek the initial Judicial Review. Given the way the new legislation is set up, its undemocratic basis and the opportunities afforded by it to run rough shod and at speed over citizens and the City Development Plan, applications for Judicial Review seem like an inevitable outcome of any application that comes in under this new regime. Every citizen has a constitutional right to fair procedure. This means the courts, and all other bodies or persons making decisions that affect you, must treat you fairly. You must be given an adequate opportunity to present your case. You must be informed of the matter and you must be given a chance to comment on the material put forward by the other side. While we were heard by the Courts, we would have serious concerns about the suitability of this new legislation in satisfying constitutional rights of other citizens in other SHD planning cases in the future. Since An Bord Pleanala issued their decision in September, we have been calling on all parties concerned to cut the grass at St. Paul’s. The playing fields at St. Pauls are acknowledged by several wildlife experts, several Government bodies and the developer themselves as one of the most important feeding sites for the protected species, Brent goose – amongst others. They are also very important to the local community in terms of football and hurling pitches, with all three clubs who were evicted from the lands last January, still struggling to find venues for matches and training. They are equally important to the overall integrity of St. Anne’s and the public’s ongoing peaceful enjoyment of this, Dublin City Council’s flag ship park. Unfortunately, this new Judicial Review process will once again delay the restoration of the fields, for wildlife or kids. Meanwhile, in our city, in the midst of this housing crisis, land which is properly zoned for large scale residential development, and on which planning permission has been granted, is being sold on without a single unit having been constructed while vast amounts of effort and resources are simultaneously exerted in an effort to obtain planning permission to build on football pitches where permission has already been refused. 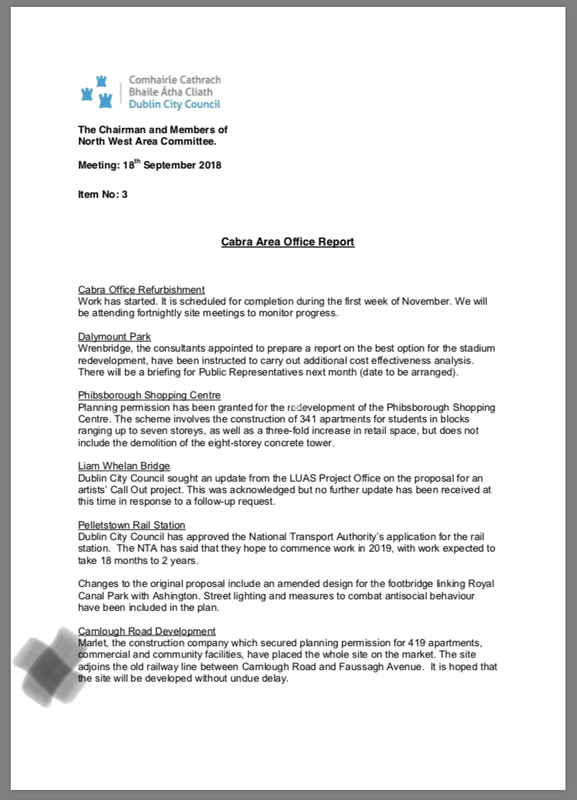 This is an excerpt from a September 2018 meeting of the Cabra Area Office of Dublin City Council, noting that Marlet, having secured planning for over 400 homes on land at Carnlough Road, have declined to build on the site and have placed it on the market.